State Representative Ron Reynolds, Bauer College Department of Accountancy & Taxation Chair Kaye Newberry, Microfinance Professor Saleha Khumawala, Congressman Al Green, Bauer College Dean Latha Ramchand and Capital One Senior Vice President of Community Development Laurie Vignaud attended a ceremony at the C. T. Bauer College of Business at the University of Houston recognizing the graduation of 44 microfinance program participants. The microfinance program at the C. T. Bauer College of Business just wrapped up its second year with the graduation of 44 participants, who in 12 weeks have begun to turn their business ideas into a reality. Saleha Khumawala, who teaches microfinance at Bauer, worked with her students this semester to facilitate the Bauer Microfinance Program at the Independence Heights Neighborhood Centers Inc. The program helps Houstonians grow their small and medium-sized businesses and empowers families through financial literacy. The program celebrated on Dec. 7 with a graduation ceremony. 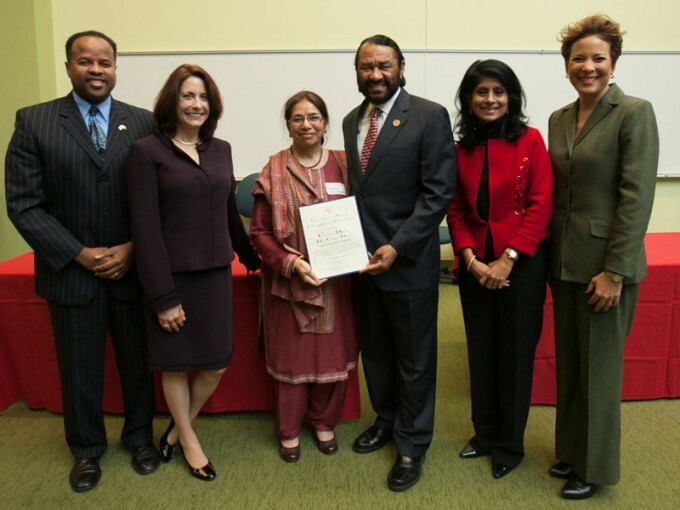 Dean Latha Ramchand opened up the event with Congressman Al Green, Congresswoman Sheila Jackson Lee and State Representative Ron Reynolds, who awarded the students with certificates of recognition. The program is sponsored in part by Capital One, and the bank’s Senior Vice President of Community Development in Texas and Louisiana Laurie Vignaud attended the ceremony to witness how the program has ties into the bank’s small business initiative. “In the city of Houston, we know small businesses and entrepreneurship is really a driver here, and we’re hoping that through this program we can continue to create new thriving businesses that will add value to the city of Houston’s economic foundation,” Vignaud said. Many of the students already have their businesses up and running or began the program with the hope that their small business could be improved. Rocio Mendez, owner of J.T. Used Cars, took the opportunity to learn more about the best way to get a business loan to buy cars at a cheaper price for the dealership. Spending leaks were also an issue for Mendez’s business, but participating in the program has equipped her with the tools she needs to save. Once Upon a Praline sprouted from idea to reality for its owner Lynn Kelly. The company offers praline gifts in a variety of flavors and has grown after learning how to set up a business plan. The lessons ranged from social media, to taxation and city permits, including everything the students would need for their business to become stable. Totally agree, all business starts with a plan, then narrow down the business focus and and start putting the business plan together and them the implementation begins. It’s not a overnight thing of course. It involved a great deal of planning, brainstorming, etc.